If you have hair of any length, there’s a more than good chance you have a hair dryer to make sure you don’t have to wait out the natural drying of your hair. Not only is that tediously slow, drying naturally does not usually end in a style you like (nor is it especially good for your hair). Blowing your hair dry is a must for so many that it has become something of an art. Professional salons can do miraculous things with your hair and the right hair dryer. And the beauty of this becoming more common is that you can find a professional hair dryer and do it yourself without the high cost of salon visits. You should also consider a good makeup mirror to fine-tune your daily style. We reviewed dozens of hair dryers to identify the best of the best. We looked at hair dryers for curly hair and those for straight. We looked at the attachments each blow dryer comes with and the quick-dry blow dryers that will give you a dry head with no fuss. For a hair dryer that will protect your hair and allow you the freedom to style it however you choose, look no further than the BaBylissPRO Nano Titanium Dryer. Early on in our research, we discovered the BaBylissPRO Nano Titanium Dryer and easily determined it would have to be our top pick. With the six temperature and heat settings, you’ll be able to customize to your preferences and by using both ionic and ceramic technology, you’re sure to have smooth and protected hair as a result. The BaBylissPRO Nano Titanium Dryer has an integrated ion generator that will let you get the sleek, frizz-free shine you want without any special product or salon prices. In fact, the manufacture lists this hair dryer as “professional” grade and, unlike a lot of others that make that claim, we’re inclined to believe it. One look at the customer reviews, and we think you will be, too. The dryer uses 2,000 watts of power and an advanced surround heat (like surround sound) for a faster dry time that will be occur evenly without overheating your hair. It also features a Nano titanium coating that will allow it to maintain a stable and high temperature heat that will protect your hair from heat damage, as well. With an overall rating of 4.3 stars and well over 2,500 customer reviews on Amazon, we feel confident that we made the right choice for our top pick. And with those numbers, the odds are you’ll agree. For a styling and volumizing hair dryer that will save you time and have you looking like you just stepped out of the salon, take a look at the Revlon One-Step Hair Dryer & Volumizer. The Revlon One-Step Hair Dryer & Volumizer may not be what you think of as a ‘traditional’ hair dryer but for the right person (and by that we mean a lot of people), this can be the hair dryer that saves you time, energy and even a bit of money. If you use your hair dryer to style your hair (and like we said, that is a lot of us), then this combines the oval brush that you’d need to purchase separately and blow dryer so that you won’t need to coordinate the complicated balance of holding a strand of hair with brush with one hand, while trying to aim the blow dryer just right onto that piece of hair. And avoiding that struggle will save yourself time and the arm soreness that often comes with styling your hair. In fact, with this hair dryer you can get yourself a more professional look that can save you an expensive trip to the salon altogether. The brush is four inches wide from the top of the bristles to the bottom and is two inches in diameter, so you’ll be able to use this on your long and thick hair with as much ease as your shorter or thinner hair. There are two heat settings, giving you the option of customizing the dry and the brush shaft will allow you to easily get up to the roots without burning yourself. 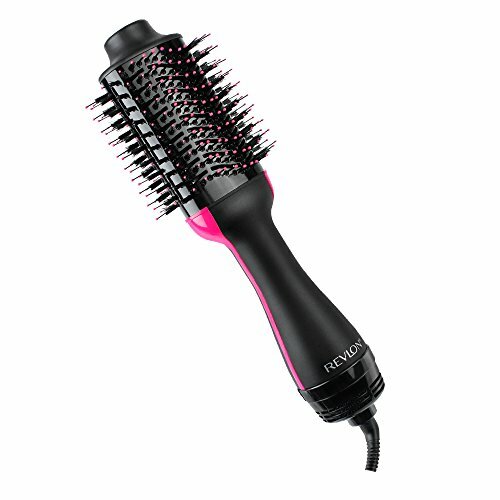 It’s a combination hair dryer, both coated in ceramic to prevent heat damage and uses ionic technology to prevent frizz. There are nearly 3,000 customer reviews n Amazon for this hair dryer earning it an overall rating of 4.4 stars. That lends strong support to the idea that you’ll be just as satisfied as the literal thousands of people who purchased and reviewed this hair dryer. All things considered, it’s no wonder this is Amazon’s #1 Best Seller in Hair Dryers and Accessories. For a hair dryer that will go where you go and not break your budget, try the Conair Vagabond Compact 1600 Watt Folding Handle Hair Dryer. The Conair Vagabond Compact 1600 Watt Folding Handle Hair Dryer is the perfect travel companion. Not only does the handle actually fold up, decreasing its size by almost half, it’s super lightweight, so you won’t need to worry about breaking any weight limits by adding this in your suitcase. It’s also dual voltage, so even if you travel abroad, you’ll still be able to use this handy hair dryer. You’ll appreciate the convenience of the hair dryer, it’s absolutely true. But you’re also going to love the price! You can pick this compact hair dryer up for just under $15! While that number is definitely one you’ll love seeing, we think you’ll be all the more impressed when you see the ratings and reviews that come along with it. It has an overall rating of 4.3 stars with right around 1,500 customer reviews on Amazon. If you have curls you waint to maintain but hair you still need blown dry, then you’ll want to consider the Magnifeko Professional Hair Dryer with diffuser Ionic Conditioning. The Magnifeko Professional Hair Dryer with diffuser Ionic Conditioning has a diffusing attachment so you don’t necessarily need to use it, but the rest of the dryer’s features are definitely well suited for its use. As with all diffusers, this is what works best for blowing dry hair while maintaining your natural curls. The dryer itself utilizes both a ceramic coating and ionic technology to reduce frizz and prevent against heat damage (and that pairs nicely with curly hair). The dryer has a safety thermostat that will insure the heating element doesn’t overheat, protecting both your hair and the dryer itself. The cord that this hair dryer comes with is an anti-tangle one, so you won’t need to focus on how many turns and twists you make in the drying process. There is an air filter along the back of the hair dryer to prevent any hair from clogging up and is removable and reusable; you can just rinse it clean of any debris and it’s be as good as new. At just over 450 customer reviews, the overall rating of 4.3 stars on Amazon seems plenty diverse enough to be an accurate reading of the dryer’s quality and value. That means we’re confident that you’re going to be well-pleased with this product; just like 87% of those who bought and reviewed it. If you love blown dry hair, but hate the frizz that often comes along with it, try the Chic Republic Professional Ionic Hair Dryer. 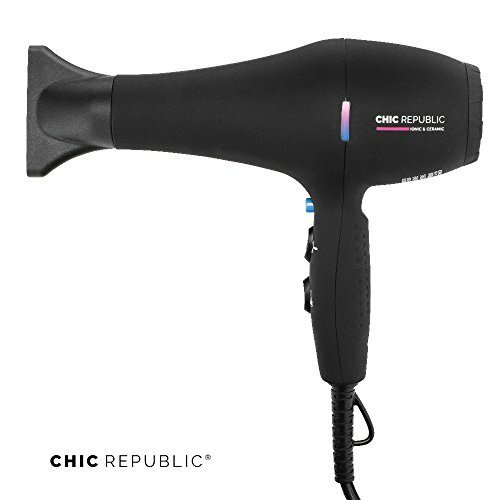 The Chic Republic Professional Ionic Hair Dryer is a hair dryer that will let you release ions into your hair that will counteract the negative effects of overexposure to moisture. This means that by using this dryer, you’ll be able to keep your hair smooth and sleek, even after the normally “hard on your hair” process of blowing dry. The ceramic coating will allow the dryer to heat evenly, and will prevent both the dryer’s mechanisms overheating and overheating and damaging your hair as well. With its 2 speed and 4 temperature settings, you’ll be able to customize the type of drying you’d like with specific detail. You can use the turbo dry with a cool airflow and that makes a world of difference for those of us who hate showering away our sweat and grim, only to immediately break a sweat under the heat of blowing dry our hair. This dryer has an overall rating of 4.4 stars on Amazon, with over 100 customer reviews. With all the features and technology it utilizes, we think it’s fair to say it’s well worth the $45 price tag. Between attachments, varied methods, and advancements in type, a hair dryer can accomplish so much now that there’s a use for one in virtually all homes. Styling your hair from wet is easier than from dry for several different of hair types and even if you have very low maintenance hair (lucky you! ), no one likes going to bed with wet hair. Plus, going through winter months without a hair dryer may just keep you from leaving the house as often – you don’t want your hair to freeze when it’s still wet! You may consider that the risk of damaging your hair with the heat of a hair dryer too much, but consider this instead: letting your hair air dry naturally will keep the hair swollen with water and put pressure on the proteins in your hair. So blowing it dry is the healthy alternative. Really, the answer to “Who should buy a hair dryer?” can be as simple as this: Anyone who has hair in their home they want to keep attractive, comfortable or healthy. But even if you’re completely bald but you have a pet whom you bathe, a hair dryer will add to his comfort, too. An art project that you want to dry the glue or paint on faster than natural can use a quick blow, even. The uses for a good hair dryer are almost endless. Diffusers. The main selling point to a diffuser hair dryer or a diffuser attachment is that it will minimize frizz. For curly hair, it can maintain curls and give them a sleek defined look (so they hold together rather than create the “poofy” look when individual hairs spread apart). For straight hair, a diffuser can give a bit of extra volume or body to your hair. In fact, it can often be labelled as a “volumizer” and be the same attachment. So those with thin hair can benefit from a diffuser boosting their hair volume, as well. The one thing you will need to keep in mind is that a diffuser is not an every day attachment. Even though a diffuser is less likely to use higher heats (note: you shouldn’t probably use it on the high-heat setting) and therefore less likely to cause heat damage, using it too often will still cause some damage. After all, it is an attachment to a blow dryer. Ceramic. The inside of a ceramic hair dryer can be coated with a ceramic layer to make sure the heat being blown is distributed evenly. This will prevent the most common problem with hair dryers: damage to overheated spots of your hair while other parts remain wet. The ceramic coating acts much the same as it does in cooking appliances; it acts as a temperature “balancer.” Not only will it balance the heat created within the hair dryer, but it will sense the heat in the room as well and adjust accordingly. So you won’t be suffering extra high heat while the dryer “warms up” in the beginning of each use. This all adds to a much safer heat that will be far less likely to damage your hair. Negative ions. Ionic hair dryers will produce millions of negative ions and release them into your hair. Unlike the positively charged ions in water, that will open your hair shafts (or, essentially “fluff” your hair and cause frizz), the negative ions will produce a smooth and sleek look. With an ionic hair dryer, you can use a lower heat to dry your hair and the definition of your curls will stay preserved without any frizz. Ceramic hair dryers do actually emit some negative ions, but not nearly as many as an ionic hair dryer. Luckily there are combinations that give you the best of both worlds, if that is your interest. Attachments. The best part of buying a hair dryer that comes with attachments is that you can get a bit of everything. And if none of the attachments give you what you want – you still have a basic, quick-dry blow dryer when all are removed. A diffuser and concentrator are the most common attachments, but you can get a pretty comprehensive variety that will satisfy most, if not all, of your hair whims. You can purchase a de-tangler or a straightener that will dry your hair smoothly, no matter how thoroughly you fussed it in the shower. A curling attachment isn’t as common, but they do exist, if you look. We especially like the whole head bonnet cap that will attach to the nozzle of the blow dryer and through a nylon tube to create a make shift hood dryer in the comfort of your home. Quick dry. If you’re not doing anything fancy with your hair dryer and you just need a rush on your hair drying a “quick dry” hair dryer is perfect for you. It usually has an attachment or two and only sometimes features any kind of ceramic coating. In fact, these have a reputation for being the “old school” hair dryers you may have had growing up. There may not be anything fancy about them (or at least there doesn’t need to be) but they’re going to get the job done and they’ll do it fast. And a wonderful perk of these is that they’re usually the least expensive option. This may end up being just the first hair dryer you own before you make a larger investment, but it’s more than an excellent start. For the most part, the use of a hair dryer is simple: a hair dryer will speed up the process of your wet hair drying. It will blow the water out of your hair, or evaporate it with heat. The type of hair dryer you choose will determine the exact way your hair will dry but the universal truth of the dryer is that its intended use is to remove wetness from your hair. Of course, a hair dryer is used for more than just drying your hair these days. The opportunity of styling your hair with ease is presented in the process of drying and with different attachments, accessories, or methods, you can use it to create so many varied looks, that the hair dryer has become more of an artist’s tool than merely a functional one. What is an ionic hair dryer and how does it work? An ionic hair dryer will release negative ions into your hair while it dries at a low temperature. Negative ions will maintain a sleek appearance by removing or counteracting the positively charged water molecules that will fluff your hair in a natural drying process. Because of this, the frizz is negated and it leaves your hair smoother than a natural dry or a standard “blow dryer” would. The drying process of an ionic dryer occurs quite a bit faster and, should you have a natural wave or curl, the ionic dryer can maintain those by keeping the curls grouped together, leaving them looking defined and preserved. Is an ionic or ceramic hair dryer better? Whether you prefer a ionic or ceramic hair dryer is entirely up to what you want the dryer to do. If you just want to make sure your hair isn’t damaged by heat, then a ceramic dryer will be quite enough. With one, you can protect your hair from heat damage and avoid any unnecessary extras. And a ceramic dryer will emit some negative ions on its own, just by design. An ionic dryer will dry at a low temperature so it won’t be as likely to cause heat damage as a regular hair dryer (but won’t protect as well as a ceramic), and it is best at preventing frizz and maintaining defined curls. Of course, keep in mind that there are plenty of hair dryers that will do both. It doesn’t have to be either/or; these two complement each other fine for plenty of types of hair. A combination hair dryer will protect your hair from damage and minimize frizz – two birds, one stone. You read this article, of course! And actually, that’s not far from the truth. The first step to choosing a good hair dryer is to do your research. Your hair is unique, but there’s a good chance that if you look into it, there are others who have hair similar to yours who have written a review about what hair dryer is most effective for getting the results you want. If you have curly hair, you’ll need to find the features that handle curls well; straightening or de-frizzing. You’ll need to find a hair dryer that has a good overall rating, then read some of the reviews to see how it handles the type of hair you have. This hair dryer features three temperature and two speed settings for a custom heat and dry. This blow dryer uses a ceramic coating and ionic technology to protect your hair and prevent undue frizz. This hair dryer uses ultra-high air flow for a fast dry and a precise temperature control to prevent heat damage. This hair dryer comes with so many attachments, you’ll be sure to have everything you need, no matter how your hair changes. What better way to have a salon result than to get a salon-style hair dryer? This bonnet will dry your hair to your choice of settings and leave you hands free. The “Cool Shot” button on this hair dryer acts as a fast trigger for a quick jolt of cool air to mix in with your regular heated blow dry. This is a hair dryer that takes drying your hair to a new level; and will make your hair smooth and sleek as a result. 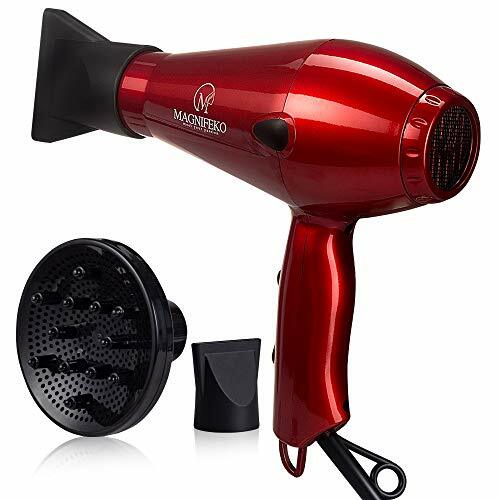 This hair dryer uses an Italian motor with 2000 watts of power to get an effective and efficient dry for your hair. Between the 5 settings and three attachments, there’s not much this hair dryer can’t do. This hair dryer has a ergonomic handles with a nonslip grip that will have you blowing your hair dry with a bit of comfort. This hair dryer is great for travel; not only does it come with a travel bag, it folds in half for compact storage. This hair dryer has a True Cold Shot button that will help you lock-in your curls and style. With an eight foot long power cord, you won’t have to worry about the distance from plug to mirror when blowing your hair dry with this hair dryer. The manufacturer of this hair dryer claims it will dry your hair in 4 minutes and while that probably depends on how much hair you have, that’s a wonderful time table for the majority of people! This blow dryer will blow negative ions into your hair, giving it an anti-static appearance with a sleek finish. This hair dryer is one that will come with both concentrator and diffuser attachments. The hanging loop on this hair dryer will allow you to hang it up on a hook so that it’s always within reach. The infared heating of this hair dryer will create a shiny look with maximum softness and control. This ionic hair dryer will let you “lock in” your style (or curls) with the cool shot function. This hair dryer has just enough setting options that it can handle your hair; no matter the type.